Last week I posted the recipe for coconut rice which comes from the northern coast of Colombia. 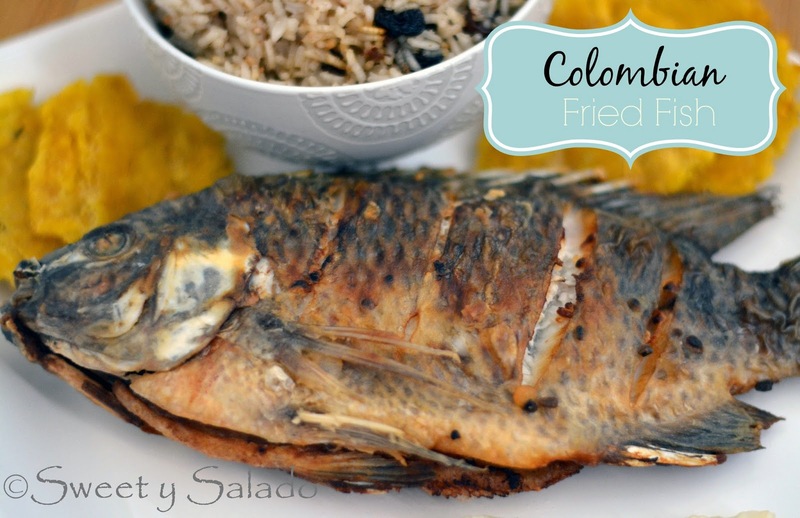 This week we’ll be making the ever so popular whole fried fish which is usually served with coconut rice and patacones (fried green plantain chips). In fact, those three ingredients make up what we call the “bandeja costeña” or “coastal platter”. 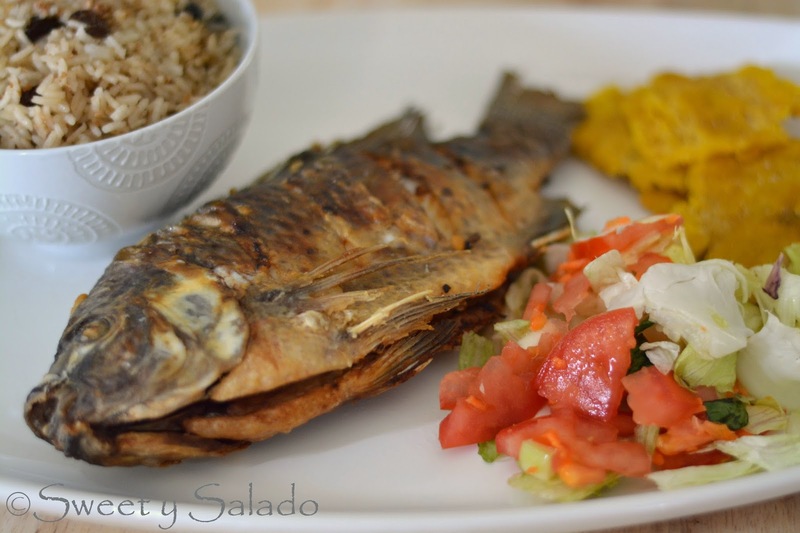 One of the most popular fish used in Colombia for this recipe is called “mojarra”, a small, tropical fish that is found in the Caribbean and South America and very similar in taste to tilapia, which is what I usually use here in the US. Many times I will have to buy it frozen because finding fresh tilapia does not happen every day, at least not where I live. Making this recipe is super easy and it’s packed with flavor even though you season it with very few ingredients. But in all honesty I don’t make it often for a couple of reasons. For one, it’s always deep fried and we rarely eat fried food at home. And secondly, having to be extra careful with the fish bones while eating is a big pain in the neck, I’m not going to lie. But, when I do make it, my family gets really excited, especially my mom and my husband who are big fans of fried fish. 1. Rinse the fish and dry well with paper towels. With a sharp knife, make 3-4 diagonal cuts on both sides of the fish. 2. Squeeze the juice of ½ lime on each fish. Season with the garlic and salt. Make sure the juice and the seasonings go inside the cuts you made, as well as inside the cavity. Let the fish rest for about 10 minutes. 3. Heat 1 inch (2.54 cm) of oil in a large pan on medium high heat for about 5 minutes or until the temperature reaches 350ºF (180ºC). 4. Dredge both sides of each fish with the flour, shake off the excess and add them to the hot oil, you may have to do this in batches. Pan fry for about 5-7 minutes per side or until golden brown. Drain on paper towels and serve immediately with Colombian coconut rice, patacones (fried green plantain chips) and a side salad.